A trivia question: Which decade embraced glam rock fashionistas skimpily clad in crushed velour hot pants and sequined halter tops, best observed shimmering and gyrating to acid rock in the purple haze of a lava lamp? If your guess was the seventies, that outfit may well have been your fashion statement. You may also recall one of the trendiest foods of that era: quiche. Hot pants (although they don’t call them that) have made a strong comeback — fortunately, I’ve yet to see a crushed velour number prancing about campus. So what about quiche? Unlike hot pants, suede-fringed miniskirts, and three-piece polyester leisure suits (what were we thinking? ), I’d like to see more quiche. Quiche — or some variation of it — has been is a mainstay in Western European cuisine for centuries. It’s considered a classic French dish today, in fact an ordinary staple to be readily found in bakeries and whipped up in household kitchens across France. And for good reason — a quiche can be whatever you want it to be, striking just the right chord in brunches, lunches and simple suppers. Delicious hot, cold or in-between, quiche is easily tote-able to a pot luck or picnic. It can be simple and nutritious, as the recipe below, or more complex, for instance, with scratch-made pastry and Camembert-bacon custard. There’s no kitsch to quiche; this savory, open-faced custard and cheese pie should never have gone by the wayside in America, seeming to fade in popularity along with soufflés and pates. It hasn’t gone by the wayside in Mara Brazer’s kitchen, however, who is always on the lookout for healthy, easy recipes to feed Eva and Marina, her twin, teenage daughters. Mara, quiche and I go way back. I met Mara, an Ann Arbor native, when we sat side-by-side in a communications class at Michigan, circa 1976. I admired the fact she was wearing a mini skirt and stacked, wedged sandals in a January snow storm. We hit it off immediately, and, down-the-road, decided to become roommates. One of my first purchases for our apartment was a cookbook entitled “Quiche”, and I followed a recipe for Crab Quiche to the letter, which scored huge points at the first dinner party we co-hosted. Mara, her partner and daughters recently came to visit, and Mara made the following recipe one night, which she explained is a staple family dinner in their home in California. Mara tells me you can add more or less spinach and cheese as your palate prefers. 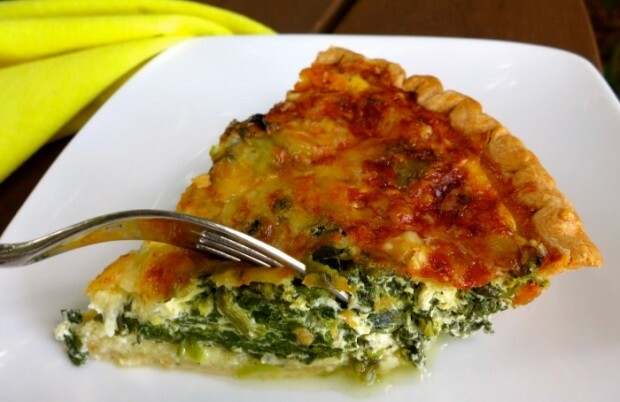 You can also substitute other vegetables for the spinach, but be she warned to be aware that mushrooms and zucchini contain a lot of water and need to be cooked down before adding into the quiche. Any frozen pie shells will do, but Mara’s family likes the Whole Food’s whole wheat shells because they are less sweet than the others, and have a crust that holds the quiche well. It’s fairly simple to throw together a homemade short-crust pastry for quiche, but this still takes time and adds to the clean-up. If you’re raising kids, any energy saved on a hectic school night is a blessing. Mara serves the following recipe with a simple green salad. All we are saying, is give quiche a chance. Cook the spinach in a microwave with a small bit of water; drain in colander. When cool, in small batches and with your hands, squeeze spinach to get as much water out of it as possible; reserve. Whisk together half-and-half, eggs, salt and pepper; reserve. all, then cover the top with remaining cheese. Bake on middle rack of oven for 40-50 minutes, or until the top is golden brown and a knife comes out fairly dry. Delicious hot from the oven, or at room temperature. More Recipes Filed Under "All Breakfast & Brunch"